The SIG FOUR-STAR 40 and FOUR-STAR 60 ARFs are coming back on the market very soon and will incorporate some significant upgrades. First of all there’s a name change. 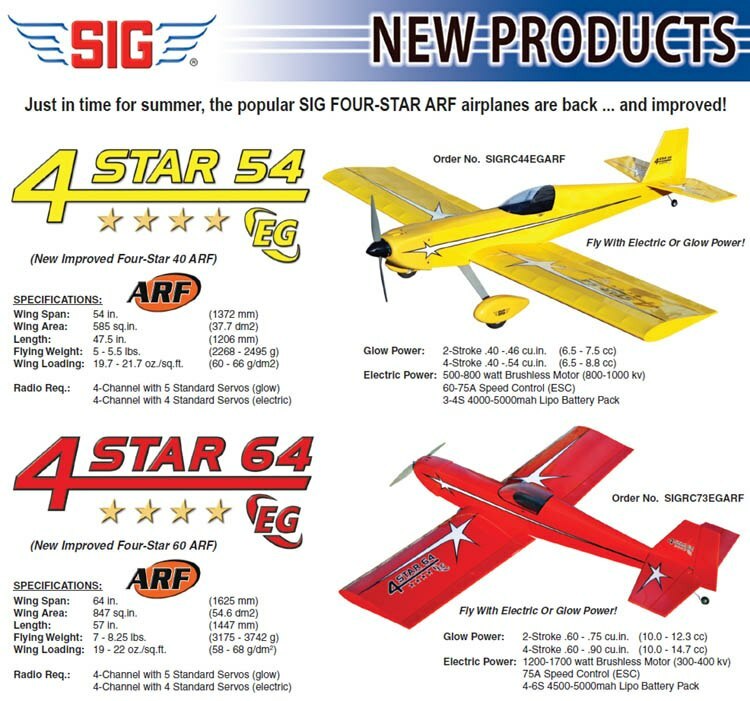 The old FOUR-STAR 40 is now called the 4-STAR 54EG ARF, and the old FOUR-STAR 60 is now called the 4-STAR 64EG ARF. The “54” and “64” in the names indicates the wingspan of the airplanes. And they are shorter! Clipping the wing has been a common modification that Four-Star pilots have been doing for many years by cutting off the last rib bay at the tip of each wing panel. The clipped wing improves the roll rate and overall maneuverability, with no loss of the original Four-Star stability and slow flight characteristics. It still lands like a trainer! The “EG” in the name means the airplane is designed to accomodate either Electric or Glow Power. Fly with a a 2-stroke glow engine, a 4-stroke glow engine, or a brushless outrunner electric motor and lipo battery. It’s your choice! All the control surfaces (ailerons, elevator, and rudder) have been enlarged for better control response at slow speeds. The Canopy has been streamlined for a sleeker appearance. That’s another change that many Four-Star pilots have been making on their own for many years – replacing the original “high bubble” canopy for a lower one. However, if you still prefer the traditional bubble shaped Four-Star 40 canopy, you can still get that as an option. They both fit perfectly! Other upgrades include a molded Fiberglass Cowling and a removable Hatch on top of the fuselage for quick access to the battery/tank compartment. Also the top of the fuselage between the canopy and the fin (the turtle deck) is now fully sheeted with balsa for smoother appearance and greater strength.